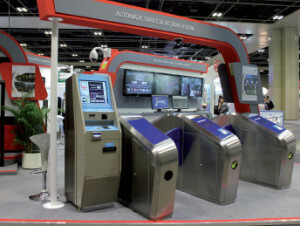 Working with commuters in mind, ST Electronics created the people-centered Automatic Fare Collection (AFC) gate for urban Mass Rapid Transit (MRT) systems. This new AFC features sleek gate cabinets, configurable to any aisle width. The new design also includes a unique tilted top surface for easy human interface, with the slope acting it a natural guide to passage direction. Rounding off its commuter-centric design, the AFC is also wheelchair friendly. The innovative AFC Gate also comes with child height sensors adaptable to variations in biological child height amongst different countries.